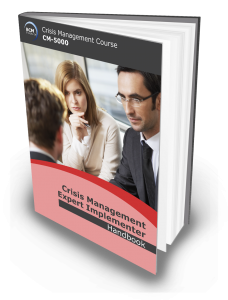 The CM-5000 Crisis Management Expert Implementer course will introduce the essential steps of developing CM strategies. It will also teach on designing and implementation of CM plans. Participants will also be taught on preparing and conducting awareness and training programmes. The course is best suited for business continuity professionals as well as new crisis management personnel. CM Certified Expert (CMCE) Certification is awarded to participants who passed the Qualifying CMCE examination. Participants would need to proof that they have at least 3 years of crisis management (CM) experience in an application form. This needs to be sent along with a non refundable SGD150 application processing fees. The application form would be shared upon passing the exams. Crisis Management, Emergency Management or Incident Management team member. Command Centre Operation or Emergency Operations Centre Team Leader. This course incorporates a 150-Multiple Choice Question electronic exam on the next day. The duration of examination is 3 and 1/2 hour. Candidates who achieve with a passing score of 75% or higher are eligible to apply for the BCM Institute’s Crisis Management Certified Expert (CMCE) accreditation. The examination fee is included as part of the course fee. SkillsFuture Credit Claimable. To know more, please visit their FAQ website. HRDF Claimable. Please refer to your respective organisation’s HR/L&D Department.